Zane Benefits, the #1 online small business health benefits solution, announced today the publication of a free eBook "Successfully Selling Defined Contribution to Small and Medium Businesses." 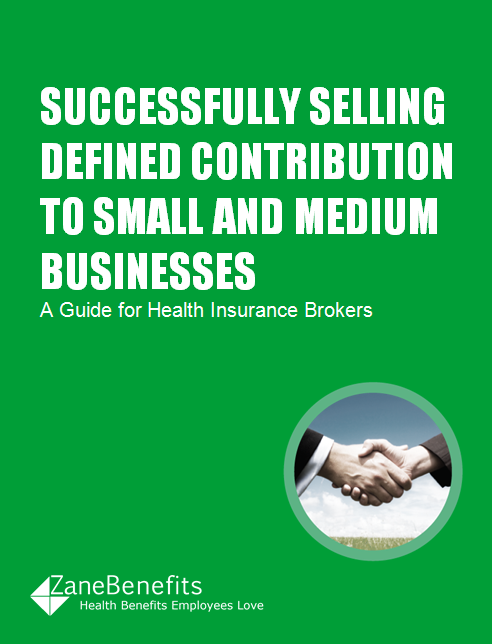 The new eBook helps health insurance brokers understand the unique buying characteristics of small and medium business (SMB) and successfully prospect and sell defined contribution health plans. According to Zane Benefits, health insurance brokers nationally are faced with decreasing group policy sales and need new tools to sustain and grow their business. This is especially true as health care reform significantly disrupts the health insurance industry for brokers and employers alike. However, the SMB market has huge buying power, and unique buying characteristics. Approached in the right way, with the right health benefits solutions, brokers have an opportunity for success in the SMB market. One of these new solutions is defined contribution health plans. By adding a defined contribution solution, brokers have a new tool to diversify and grow their book of businesses and build a foundation to thrive in 2014 and beyond. Veteran, experienced, and new health insurance brokers should download this guide to learn how to successfully sell defined contribution to small and medium businesses.